Ronnie Barker stars as Arkwright, the stuttering grocer, in the first series of this cornershop comedy. Arkwright's urge to take money from his customers by fair means or foul is second only to his need to prevent his nephew, Granville, from discovering a world beyond the clang of the shop bell... And, of course, his consuming passion for Nurse Gladys Emmanuel. All six episodes Full of Mysterious Promise: "Why don't we get engaged befor..
Own Open All Hours Series 1 to 4 Complete Collection DVD from Deff, DVD, Blu-Ray & 4K Video Specialists - Free UK Delivery..
By Roy Clarke Ronnie Barker's tight-fisted shopkeeper Arkwright continues to risk amputation rather than replace his death trao of a till. As Nurse Gladys Emmanuel, the owner of an awesome bosom and an old Morris Minor, deflates his amorous advances, Arkwright seeks solace in bullying his over-worked, sexually and socially-frustrated nephew and errand boy, G-G-G-G Granville. Laundry Blues When Nurse Gladys Emmanuel tells Arkwright that ..
Ronnie Barker's stuttering shopkeeper Arkwright lives for just three things - a regularly ringing till, a glimpse of Nurse Gladys Emmanuel's more than ample bosom and making the life of his nephew and errand boy, G-G-G-Granville ever more miserable... An Errand Boy By The Ear: Arkwright's baffled when his customers get upset with his treatment of Granville. Surely, "it's what errand boys are for." 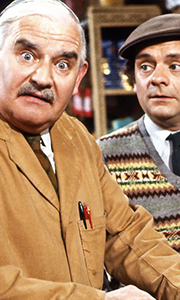 The Ginger Men: Why is Arkwright fo..
Ronnie Barker's great creation, Arkwright, continues to mind the store where the only thing going cheap is talk. The elusive Nurse Gladys Emmanuel is still there to drive him to distraction, while delivery boy Granville just yearns for a trendy girlfriend, a high-powered executive job, a sports car or even a new bell on his bicycle. Soulmate Wanted: Granville is desperate for female company, so he decides to resort to advertising. He en..